After you have been holding ’em Texas or Omaha style for a while, you will likely marvel or even scoff at Razz poker, a game where your explicit goal is to put together the lowest, weakest hand possible. Counterintuitive and initially confusing, this lowball poker game cannot compete with the popularity of conventional variants. However, after a slowburn growth in following and several high-profile tournaments, Razz poker has finally broken out into the mainstream. So, if you are a poker enthusiast with a knack for mental gymnastics and a thirst for new challenges, read on for our breakdown of razz poker rules before you dive into this exciting new stream. Razz poker has been around for a long time, and it made its official World Series of Poker debut in 1971. After dropping out in 1972, it has been a regular event in the series from ’73 on. Razz is the “R” in the H.O.R.S.E. game rotation. 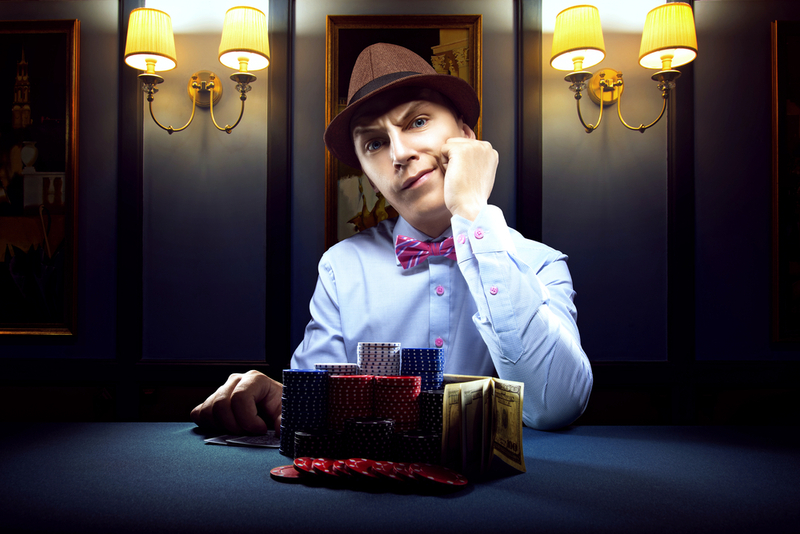 Although it is the best known lowball poker variant, its popularity pales in comparison to hold ’em games, for example. T. J. Cloutier’s epic televised tournament win during the WSOP 2004 is largely billed as the moment Razz poker became certifiably cool. Think of Razz poker as a reverse seven-card stud. Each player of a maximum of eight is dealt seven cards (four face up, three face down) and has to make the lowest unpaired five-card hand possible. Razz usually comes with limit betting although a pot limit version, known as London Lowball, is popular in Europe. To simplify the race to the lowest hand possible, Razz poker rules ignore flushes and straights. Pairs, on the other hand, count as usual and ultimately doom your hand, so keep them out! After the players ante, they get two hole cards (face down) and one door card (face up). The player with the highest door card then initiates the betting and is, thus, “bringing it in”. The “bring it in” bet is usually a fraction of the regular bet – 1/3 to 1/2 – but the player can also “complete” and place a full starting bet. The other players may choose to match the “bring it in” or to complete it if the initiator did not do so already. If two players have equally high door cards, suit determines supremacy, with spades, hearts, diamonds, and clubs in descending order. After the initial round, betting commences clockwise from the lowest hand showing, and players are dealt an additional card face-up in each round. The final, seventh card is face-down. Since the objective of Razz poker is to amass the lowest hand possible and aces are always low, the worst card imaginable is the King of Clubs (highest card in the highest suit). When it comes to unpaired hand rankings, it may take some time to wrap your head around it. Classic poker games usually focus on combinatorics and card interactions within a hand; you need to scrap that thinking. Focus instead on how high the first card in your hand is, then the second, then the third, and so on. According to that logic, the strongest hand in Razz poker is 5 – 4 – 3 – 2 – A, followed by 6 – 4 – 3 – 2 – A and 6 – 5 – 3 – 2 – A. Do you catch the drift? We focus on unpaired hand rankings here because a pair pretty much puts you out of the running, and you should seek out whatever unpaired combination possible, of course. To get ahead in Razz poker, play only unpaired cards and monitor your opponents’ door cards closely in order to predict the likelihood you end up with a pair in your hand. As a rule of thumb, do not put card above 8’s into play. If you are to the right of the “bring it in” bettor, hold a lower door card, and other players fold, you are in a good position to steal that bet; go ahead and raise! Practice makes you a Razz-amatazzing player! The best way to learn how to play Razz poker is to hole up in your favourite online casino and play until the rules become second nature. Soon enough you will start seeing the charm and fun in this quirky form of poker which is just as strategic and exciting as its popular big brothers.